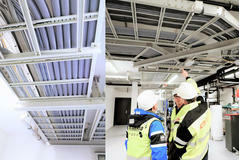 Oglaend System delivered FRP fiberglass support system to Bremnes Seashore's new hatchery in Trovåg, Norway. Our customer Helgevold Elektro carried out the electrical and automation contract at the hatchery. This is an indoor facility with very high corrosivity, partly due to stagnant seawater. In the marine farming industry it is important that all technical equipment, and inventory is corrosion resistant. Helgevold Elektro had some previous experience with FRP installations from another hatchery. Bremnes Seashore in Trovåg chose to use Øglænd System's FRP products, including: cable ladders, lighting channels and support systems. FRP is a particularly good solution for hatcheries to prevent corrosion. The FRP system is very well suited in industrial areas with corrosive environments. FRP is suitable for lighter installations and heavy industry applications with heavy loadings. FRP is very corrosion resistant. 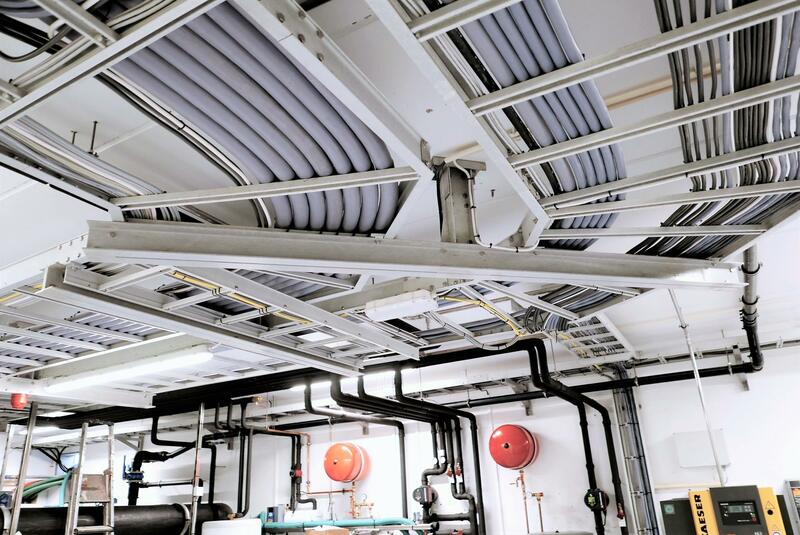 In addition, the system can be delivered with complete FRP fixings including fasteners (instead of stainless steel), for special applications. Flexible installation. The FRP system can be combined with our other systems. Smart Jig drilling templates are used for easy customization and installation. The FRP system is self-extinguishing and halogen free. It is UV protected and can withstand very low temperatures. The FRP system is adapted to our 3D design libraries, for easier engineering support and benefits from our long experience in the oil & gas and wind industry. In addition to the corrosion resistance, the equipment is easy to work with. All cutting and customization work can be done indoors, without creating any sparks or fire hazard. - Svein Tore Veim, Project Manager at Helgevold Elektro.